WinZip is trusted by millions of businesses and consumers to boost productivity, simplify file sharing and keep information private. The world's number one compression and encryption software, WinZip offers apps for all of today's most popular platforms and devices, giving users a better way to exchange files in the cloud, email and social media. WinZip's product line also includes powerful utilities to improve system performance and help keep PCs secure. WinZip is the industry's leading application to create and unzip Zip and Zipx files and open compressed files including Zip, Zipx, RAR, 7Z and more. 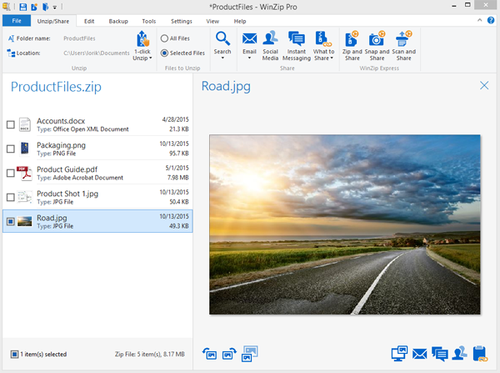 Offering powerful file management and file sharing capabilities, WinZip 20 connects directly to your accounts on cloud services including Box, Dropbox, Google Drive, OneDrive, SugarSync, MediaFire, ZipShare and CloudMe. WinZip is part of the Corel family of companies. Headquartered in Mansfield, CT, WinZip Computing also has offices in Canada, Spain and the UK. Break out the cake and balloons because WinZip just turned 20. And, it has definitely gotten better with age. Much better! Our developers have heard your wants and needs and have brought to you the next-generation powerhouse — and one-stop-shop — when it comes to file compression and file management. Yes, you read that right. WinZip 20 isn't just a file compression utility. It's your solution to managing all your files - or "digital chaos" as we like to say. With faster performance, brilliantly enhanced cloud capabilities and new ways to share, there's no better way to manage all your files - whether they are stored on your local machine, your Windows Homegroup, perhaps a network, and most definitely on your cloud services. How many files and applications do you use when working on any given project? Probably a handful, at least? Because of WinZip's impressive NEW File Management ribbon (see it below), it's incredibly easy to get your project done quickly and with no fuss. As you can see, all your options are at your fingertips. Let's say one of the files you're working on is a Word doc saved to your cloud and you need to update it. Before WinZip 20, you needed to go to your cloud, find your file, open it in Word, make your change, save it back to your cloud. Then you could zip it up and share it. With WinZip 20, all you need to do is open WinZip, find your file (and it's likely in the NEW Frequent Folders, which we'll get to in a second), select it and it will automatically open in Word. From there, make your changes and save it. The changes you just made to your Word doc in WinZip have been automatically saved back to your cloud. Check out what else you can do. But, life is busy and fast-paced and we know you don't have time to fool around. You need to get to your files, and fast, which is no problem with WinZip 20. When working on your project, and you have all sorts of files and folders on the go, how easy is it to keep track of them all? It's mind-numbingly frustrating having to constantly toggle back and forth. You will most definitely find your most used files and folders quickly and easily thanks to the NEW Frequent Folders. Simply, open WinZip, click on the Frequent Folders icon and, Voila!, there they are at your fingertips. And, it updates dynamically. 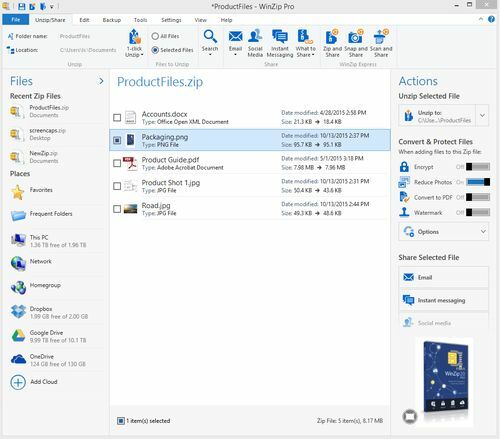 Plus, WinZip's incredible NEW Previewer feature displays document and image previews of files in your Zip, on your computer, and for files on your clouds. This is a definite plus when trying to find your files fast. While you're previewing, you can rotate and resize images, save images, and share the previewed file by email, instant messaging or social media. More than you can do using Windows Explorer! The time you save really is mind-blowing. And, speaking of sharing, who would have thought there could be even more ways to share. Even More Sharing Options? Yes! We love to share, share...and share some more. We share anything from a funny picture to a recent video we took to a spreadsheet that we need to send our team at work to music. And, when we want to share our file, we want to share it now rather than first going through 7 steps. So, let's say you want to share an amazing photo you took but you need to resize it first. Do you really want to go through the process of trying to figure out how to download the photo from your camera or phone? Once you've figured it out, you need to go to where it's stored to open it, then you can resize it (using another application), then you save it, then you need to find where it's stored again to select it, attach it to your email and then you can finally share it. So much time wasted and what a long process! It's unbelievably easy to find, modify and share photos using the NEW Snap and Share feature in the Pro version because WinZip automates this whole process. All you need to do is hook up your camera to your PC or device and, before you know it, you're viewing previews of all your photos. While you're at it, go ahead and resize and share right in WinZip. It's as easy as 1-2-3. Perhaps you printed the photo already and want to scan and send to family. The days are gone where you need to place your photo in your scanner, select the scanning function, wait for it to scan, save it, find the file, attach it to your email and then send it out. Thanks to the NEW Scan and Share feature, connect your scanner to WinZip 20 and it will scan your photo (and documents, like your receipts and financials). All you need to do is choose how to share it. And, there are a ton of handy sharing options. Choose from NEW YouTube for videos, NEW Twitter, NEW Office 365 groups as well as Facebook, Twitter, LinkedIn, Google Talk/Google+ Hangouts, Yahoo! Messenger and Jabber. And, one more thing. With WinZip 20, you never need to worry about who will see your photos you snapped or documents you scanned because WinZip can encrypt them for you. Only those who you want to see your files have access. That's what you call peace-of-mind. But, back to that project you're working on. You likely should backup all those files. But how do you backup and share the files all in one package if they're stored in different locations? It really is more than just a backup tool because you can use it to package files from your computer, network, and cloud services into a single Zip file. And, WinZip can save your Zip file anywhere, including the cloud. Or, have WinZip email or instant message your Zip file to automatically distribute your package of files. Go ahead, enjoy the convenience of flexible backup and distribution, either manually or automatically. The choice is yours. WinZip continues to be the leader in compression size and performance and it's clear that WinZip 20 is your best solution for managing your digital chaos. I urge you to invest by getting up-to-date. When you do, you will be a step ahead of the rest when it comes to managing your files. WinZip isn't just a zipping utility, it's so much more so don't wait to get on board. As a thank you for your ongoing loyalty, you will automatically save 50% off the regular price. And, don't forget about our 30-day money back promise on every software purchase. Have the advantage of personally using it in your home or office under everyday conditions. If, for any reason, you wish to return it, we will still consider you one of our very good customers, and we will return your full purchase price. WinZip is a proven product. Learn more about it and while you're at it, compare the Standard and Pro versions. Then, take the next step. WinZip 20, WinZip 20® Pro, and WinZip® 20 Enterprise. New! More robust file management: WinZip 20 offers centralized file management via a new File Management ribbon and quick access to all your files on your PC, network, Windows homegroup and cloud services. Easily find your most-used files and folders in Frequent Folders, updating dynamically. Open and edit files from within WinZip. Create folders on your PC, network and cloud services. Wipe files and folders for secure deletion. Copy, move, delete and multi-rename files wherever they are, and more. New! More sharing options: WinZip 20 offers new support for YouTube, Twitter IM, Office 365 groups, in addition to Facebook, Twitter, LinkedIn, Google Talk/Google+ Hangouts, Yahoo! Messenger and Jabber. Easily email large files and share via your cloud accounts. Select your files, set encryption and conversion preferences, and choose your sharing options, all in one place. Sharing by Skype and other apps is easy with automatic links available for pasting from the Clipboard. New! 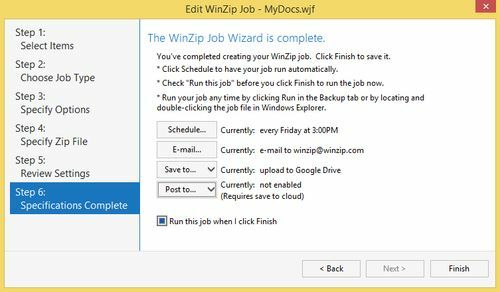 Powerful backup: The Job Wizard lets you automate backup and distribution, and send notifications by social media and IM when backups are complete. The new Job Wizard Super Picker lets you include files from your computer folders, the network and cloud services in one backup. Choose to save the resulting zip file to the cloud and take advantage of the option to send the zip via email according to your schedule. New! 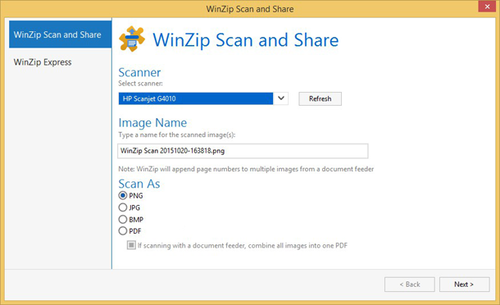 Scan and Share: Start your scan right from WinZip and choose to encrypt scanned items. Save your scanned document locally, on the network or on a cloud service. Share by email, social media or IM. New! Snap and Share: Streamline photo sharing by getting photos directly from your camera or phone to share via WinZip. 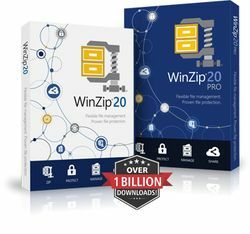 Building on the power of WinZip 20 Pro, the new WinZip 20 Enterprise enables corporate and government customers to implement enterprise-level encryption across their workforce and protect critical data. Organizations can boost productivity while taking advantage of secure file sharing across email, enterprise platforms and the cloud. Ideal for multi-lingual environments, WinZip 20 Enterprise offers FIPS 140-2 security standard compliance and support for enterprise platforms including SharePoint and Amazon S3. The world’s #1 compression software is leading the way in flexible file management. Browse, open, manage and share files and folders on your PC, network or cloud services—all in WinZip® 20. Resize photos and instantly post them to social sites. Zip large files so they take up less space in the cloud. Sharing personal or business information? Lock it down with powerful AES encryption. Easily convert to PDF, add watermarks and more. The dynamic interface changes to suit your task, making it easy to find the right files and features when you need them. Experience a flexible new way to manage all your files—with protection you can count on—in WinZip 20. Get versatile file management, trusted compression and encryption, plus new backup, sharing and previewing features in WinZip® 20 Pro. Combine local, network and cloud files in one automated backup. Scan and share documents, receipts, photos and more directly from WinZip, encrypting if you wish. Retrieve photos from your camera, resize them and share with ease. The new Previewer lets you quickly find photos and documents on your computer, network and clouds. Finding and working with files on your PC, network and cloud services is easier than ever with the new File Management ribbon. Take control of your files, protect your information and share the smart way with WinZip 20 Pro. Along with the proven compression, encryption, sharing and backup in WinZip 20 Pro, this special version includes support for SharePoint and Amazon S3. This allows your business to offer employees easy, secure sharing across email, SharePoint, Amazon S3, and IT-enabled clouds, social media sites and instant messaging services, all from one application. WinZip 20 also ensures your business meets U.S. government requirements for FIPS 140-2 encryption, both at rest and during exchange.